Offering spacious accommodations along with cultural activities, this Native American-owned hotel is situated in Santa Fe's Railyard District and features exceptional on-site spa services and gourmet dining options. "Mah-Waan, Mah-Waan" For us hospitality is an honored tradition. 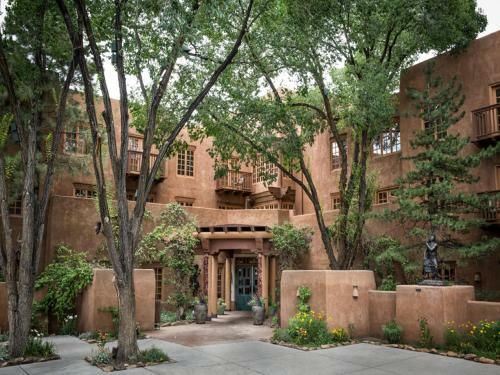 In this spirit we welcome you to Santa Fe’s only Native American-owned hotel. Located in Historic Downtown Santa Fe and in the heart of the new Guadalupe Railyard District with museums, galleries, shops and restaurants just outside our door. Hotel Santa Fe The Hacienda & Spa offers a unique cultural experience, from our luxurious rooms and suites to the lilting notes of a Native flute to the culinary brilliance of our Amaya Restaurant. This difference truly sets Hotel Santa Fe The Hacienda & Spa a world apart. Thanks for the mention Sunshine with Savannah!